Mascot Label Group has revealed the cover artwork and the Monday 14th Octoberrelease date of Flying Colors: “Live In Europe” on the Music Theories Recordings Labelon Blu-ray, DVD, 2CD, Limited Edition 3LP Vinyl and Digital download (iTunes, Mastered for iTunes, Amazon MP3). 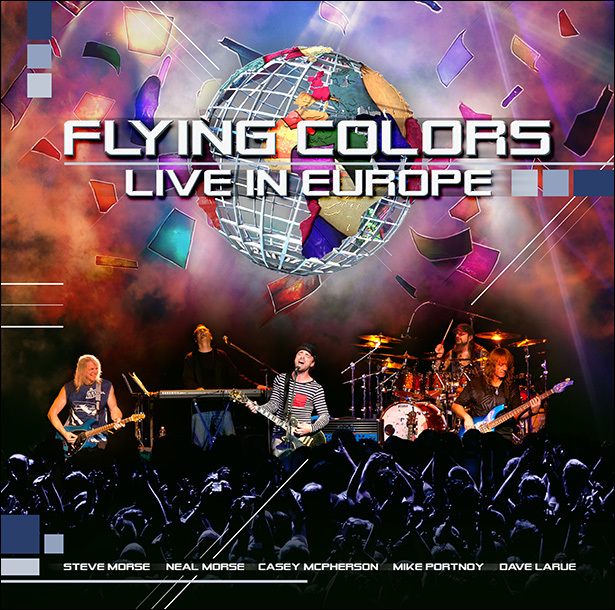 Flying Colors features Mike Portnoy (drums, vocals), Dave LaRue (bass), Neal Morse(keyboards, vocals), Casey McPherson (vocals, guitars) and Steve Morse (guitars). The concert release captures the band live in Tilburg, Netherlands at 013 on September 20, 2012. Directed and edited by Bernhard Baran (Guns ‘n’ Roses, The Cure, Porcupine Tree) with Bill Evans as executive producer, the concert presents the entire studio album, alongside popular favorites performed by the individual members of the band. The Limited Edition Vinyl Set includes 3 LPs on 180gr colored vinyl, a LP sized booklet and an exclusive bonus track. The Blu-ray and DVD include stereo and 5.1 surround mixes. Every effort has been made to assure the highest audio quality. All Blu-ray audio being uncompressed, mastered for iTunes is prepared from a 96KHz/24-Bit master, and the vinyl edition spans 3 audiophile-grade LPs. The vinyl edition can be exclusively pre-ordered here. The Blu-ray and DVD includes the 45-minute documentary ‘First Flight’ featuring exclusive interviews with the band members, meet & greet footage and candid moments on the road captured backstage, in the dressing rooms, the band bus, and during tour rehearsals. The documentary also features excerpts from songs recorded during the band’s very first show (LA, USA), first show in Europe (Hamburg, Germany) and final show (London, UK) of the tour.